JW's teach that Jesus is only Michael the archangel! I do not enjoy calling any religious group “of the Devil.” I am not a hateful person. I love all people, including Jehovah's Witnesses, sincerely. Albeit, the Bible is the inspired Word of God and we are taught in many Scripture passages that the Devil is a liar, a thief and a murderer (John 8:44, Matthew 17:15). The Bible plainly warns us that Satan transforms himself into an angel of light (2nd Corinthians 11:13-15). Lucifer is a beautiful being in appearance according to Ezekiel 28:17, unlike the commonly perceived red Devil with two goat horns and a pointy arrow for a tail. The Devil wants you to think of him in terms of ugliness, so you won't recognize him when he comes to deceive you. The trustworthy King James Bible warns us about three falsehoods; namely, ANOTHER JESUS, ANOTHER SPIRIT and ANOTHER GOSPEL . . .
What does the Bible mean by “another Jesus?” It means that anyone who portrays Jesus as being somebody different than Who the Bible presents Him as is of Satan. Who is Jesus according to the Bible? Jesus is almighty God (John 1:1-3, 14; 1st Timothy 3:16; John 10:33; Revelation 1:8). Revelation 1:8, “I am Alpha and Omega, the beginning and the ending, saith the Lord, which is, and which was, and which is to come, the Almighty.” This fundamental doctrine of the Christian faith is often referred to as “Jesus' DEITY.” Jehovah's Witnesses (JW's) errantly teach that Jesus is “a god,” but not “the God.” JW's have “another Jesus” that is not of the Bible. Jesus is the only begotten Son of God. JW's errantly teach that Jesus is merely Michael the archangel in the flesh, and that Jesus exists as Michael today, Lucifer's archangel brother. This is utterly unbiblical. Lucifer is an archangel, along with Gabriel and Michael. Lucifer rebelled against God, as recorded in Isaiah 14:14 and was cast out down to the earth (Revelation 12:4) with one-third of the angels (symbolized as “stars” in the Bible according to Revelation 3:1). In sharp contrast, the Bible teaches that Jesus is the only biological Son of God the Father, which makes Him literally God almighty Who came in the flesh. Jesus and Lucifer are NOT brothers as Jehovah's Witnesses teach. To claim such a thing is blasphemy against the deity of Jesus Christ and a doctrine of devils. Jesus is almighty God, an equal member of the Godhead and the only begotten Son of God!!! Amen and amen! JW's attempt to bring Jesus low, trying to diminish His preeminence, attacking His deity; but they are fools who corrupt the Scriptures. Some people may ask, how do you know that you are right as an Independent Baptist and the JW's are wrong? I know because every false religion can be traced to a man or woman, or group of men and women, as their AUTHORITY. It was a Masonic 33rd degree Luciferian-worshipping man named Charles Taze Russell who founded the Jehovah's Witnesses religion in 1874 in New York to deceive the masses. I am a Baptist, but first and foremost I am a born-again Christian. You don't get to Heaven by joining a Baptist church; but rather, you get saved by acknowledging that you are a guilty sinner in God's eyes for breaking His commandments in the Bible (Romans 3:19), and placing your trust (believing) that Jesus is the Christ Who died upon the cross for your sins, was buried and RESURRECTED from the dead after three days (1st Corinthians 15:1-4; Mark 1:15). JW's teach that Jesus DIDN'T raise BODILY from the dead; but rather, only in spirit. In sharp contrast, the Bible teaches in 1st Corinthians 15:6 that Jesus was SEEN after He bodily arose from the dead by over 500 witnesses. Whew! Jesus is God almighty!!! Jesus' disciples VISIBLY watched Him ascend into Heaven in Acts 1:9-11. Truly, it is very easy to expose the cult of Jehovah's Witness if you believe the Word of God, because JW's pervert umpteen fundamental doctrines of Christendom. JW's teach a host of weird and bizarre doctrines of devils that are nowhere taught in the Bible; such as, forbidding blood-transfusions, forbidding allegiance to one's own country, and a forbiddance to celebrate holidays. I have focused instead on the most fundamental doctrine of the Bible, which every satanic false religion attacks, which is Christ's deity and the Godhead. JW's completely deny the doctrine of the Godhead. Please understand that I am NOT saying Jehovah's Witnesses are not sincere. I am not saying that they are not hard-working. I am not saying that they are mean or unkind. I am simply contending for the Christian faith. 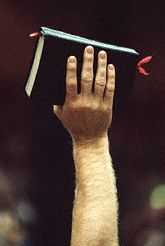 As a God-fearing Christian I am commanded (Titus 1:10-13) to REBUKE THEM SHARPLY. I am commanded in Ephesians 5:11 to refute (Greek: elencho, “to expose”) them as sinister ministers of Satan for teaching ANOTHER JESUS, which 2nd Corinthians 11:13-15 plainly warn us about. JW's also teach “another gospel,” errantly requiring people to add works to faith for salvation, including the unscriptural requirement to be water baptized to be saved. The false teaching that water baptism is necessary for salvation is called “Baptismal Regeneration.” Seventh Day Adventists, Mormons, Church of Christ, Church of God, Roman Catholics and Lutherans all require water baptism for salvation, which makes them each satanic religions. Jehovah's Witnesses teach ANOTHER GOSPEL, which is not another, because there is only one true gospel as taught in 1st Corinthians 15:1-4. Kindly, in the love of Christ Jesus, I plead with you whoever you may be to avoid, leave and warn family and friends about the satanic religious cult of the Jehovah's Witness. I do not mean to be unkind; but rather, to keep you from going to Hell for all eternity to burn in fire (2nd Thessalonians 1:8-9), paying for your own sins because you trusted in a false gospel of self-righteousness (Galatians 1:7-9; Romans 10:3-4). It will be a horrifying event at The Great White Throne Of Judgment (Revelation 20:11-15) for Jehovah's Witnesses and other false religions . . .
Beware of the Jehovah's Witness religion, which is of the Devil, by the Devil and for the Devil whom they unknowingly serve. Freemasonry is the common denominator behind many false religions, intended to lead the masses of the world into the New World Order to worship the coming man of sin, the Beast, the Antichrist! Have you believed a lie!